​Burping. Ghosting. Plunger. The world of fountain pens has enough terminology to give Webster’s dictionary a run for its money. Even if you are familiar with fountain pens and have been using one for some time, the jargon may still seem a little foreign. 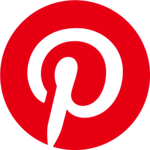 While researching or reading reviews, you have probably come across the term ‘posting’. 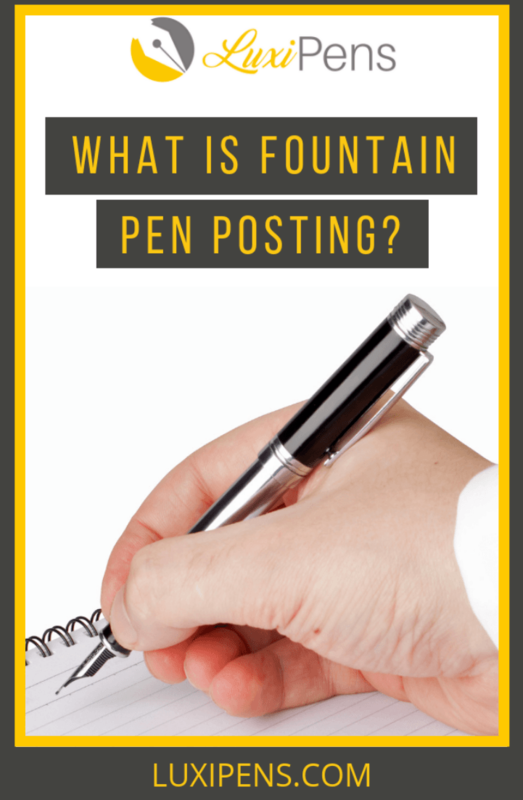 Fountain pen posting describes the act of placing the pen cap on the end of the fountain pen as you write. Cap posting (or posting a fountain pen cap) is fairly common with ballpoint pens. In fact, we've often posted caps in grade school when learning to first write, so as to keep track of the pen cap. ​So how does posting a fountain pen affect your ability to write? Many factors influence your decision to post your pen, including the design of the fountain pen and its balance in the hand. 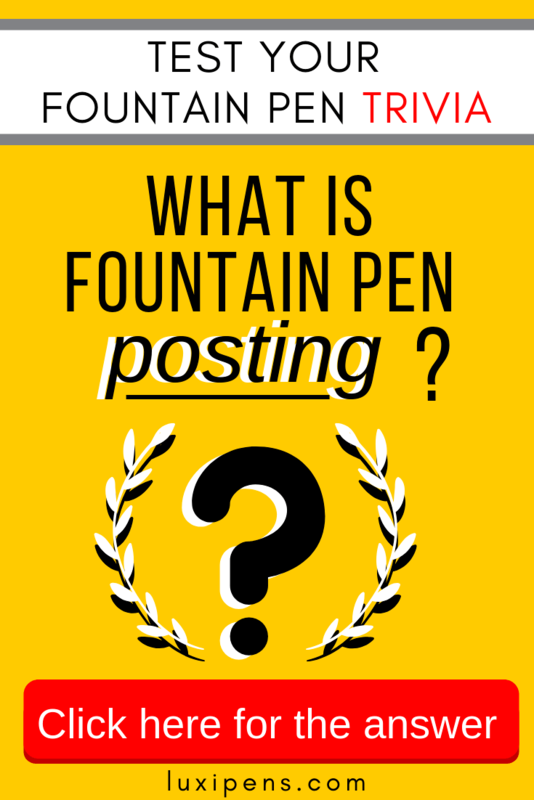 ​What is posting a fountain pen? 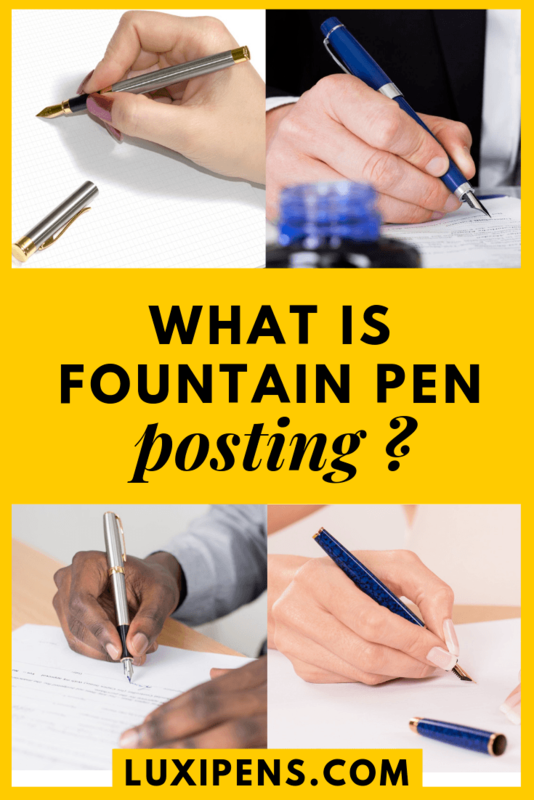 ​‘Posting’ is fountain pen terminology for placing the cap on the back end of the pen while you write. People may also refer to this action as “capping the pen”. When the cap is left off, it is called leaving the fountain pen ‘unposted’ or ‘uncapped’. Occasionally, the style of the particular pen affects whether it should be posted or unposted. Some fountain pens are designed for posting, as placing the cap on the back of the pen will improve the writing process. 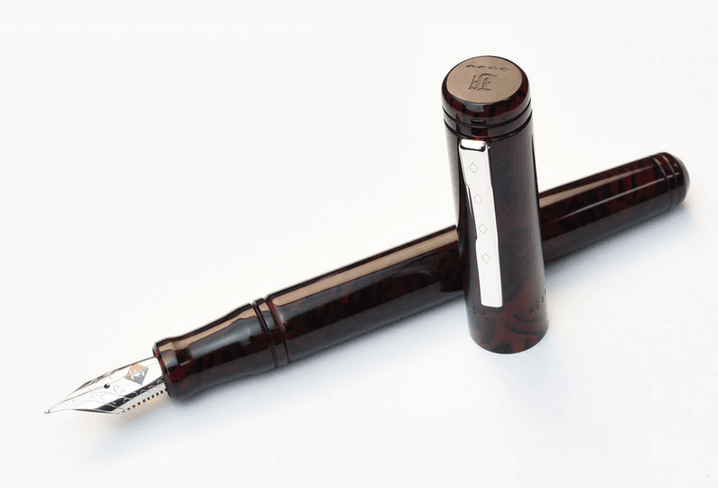 Other models are made for the fountain pen cap to be left unposted as you write. When posted, the cap should securely attach to the end of the fountain pen barrel, opposite of the nib. This adds balance to the pen, making the writing process effortless. A loose cap may move on an improperly posted pen, upsetting its balance and making writing more challenging. This can also become a distraction that makes fountain pen writing less soothing and relaxing. ​Fountain pen screw caps twist on to the end of the barrel while you are writing. These caps have advantages and disadvantages that can affect whether or not you’re likely to post your pen. Some users prefer to post their screw cap fountain pens because it adds more security during writing and travel. The posted cap will even out the pen’s weight distribution, creating a more balanced feel in the writer’s hand. Threading makes the cap less likely to loosen while writing. These are the ridges that securely attach the cap to the pen when it is screwed into place. Screw caps will not detach even with significant movement, such as storing the pen in a bag or a pocket during travel. On the other hand, other users do not post their screw-cap fountain pen. Taking the time to manually turn the cap through the threading to securely attach the cap is more time-consuming than other slip-on or clutch caps. Regular posting also requires frequent cleaning and maintenance to keep them performing in top condition. There is also a margin of error when using a screw-on cap: the user can tighten it too much, making the pen more difficult to unpost. The inability to replace the cap over the nib can result in damage to the nib. It can also be challenging to find a pen that will screw-on in both the posted and unposted position. Many modern screw cap fountain pens screw-on to protect the nib, but then slip-on when posted. Pens that have screw caps for both capping positions are readily available through custom fountain pen artisans. ​Slip-on caps simply slide onto the end of the pen barrel. Some will audibly ‘click’ into place, while others have a cap band. The cap band is a ring of metal placed near the bottom of the lid to prevent the lip of the cap from splitting if it is pushed down too far onto the pen barrel. It is important to note that there are fountain pens that screw-on when capped, yet snap to the barrel of the pen when posted. Slip-on caps are more convenient than screw-on caps, but they come with their own set of disadvantages. While slip-on caps are easy to remove when using the fountain pen, they may come off during unwanted moments as well. The cap can slide off during storage and travel, which can lead to significant nib damage and replacement. Similar to screw caps that can be screwed on too tightly, the slip-on cap can also be posted too forcefully, causing the cap to break. ​Clutch caps have a clutch ring, which is a springy piece of metal that uses friction to squeeze and hold the fountain pen securely to the lid. These caps offer the stability of a screw-cap with the convenience of a slip-on cap. ​The clutch cap gets its name from ‘clutching’ and gripping both sides of the fountain pen, making posting and capping more secure than a traditional slip-on cap. A clutch ring holds the cap in place, reducing its ability to slip off while in use or in transport. As the clutch ring is the mechanism that connects the cap to the barrel, consistent use can loosen the ring. A loose clutch ring can scratch the barrel, ruining the beauty of the fountain pen. ​Something else to consider when choosing a fountain pen is opting for a lid with a clip on it. The clip is usually a long, thin shape that sticks out on the side of the cap to prevent it from rolling away. It is a useful investment for people who want to set the lid on the desk, rather than holding it in their non-dominant hand while writing. ​Posting is a personal decision based on preference. There are several advantages and disadvantages to consider as you decide if posting works for your writing style. ​Posting a fountain pen makes the pen longer with a heavier on the end of the barrel. This creates better balance and prevents excess weight on the nib of the pen. The lighter weight prevents the nib from digging into or ripping the paper. Having an equally-balanced fountain pen greatly benefits fountain pen novices. New users often need to become accustomed to the difference in weight between the fountain pen and other writing instruments. ​The additional weight added when posting improves writing performance for people with shaky hands by providing more control. Those with sizable hands might prefer posting with larger fountain pens as well. This makes the pen heavier and longer, so it fits better in the writer’s hand. 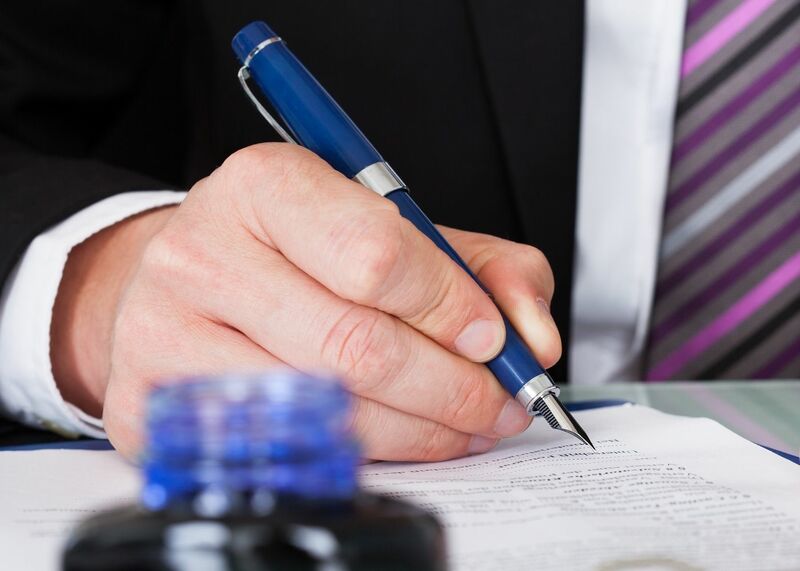 ​People who tend to have cluttered desk or work spaces opt to post the fountain pen to prevent lost lids. Additionally, if you are willing to share your fountain pen with others, deciding not to post almost guarantees your fountain pen will be returned. If someone does mistakenly walk off with your pen, they will be reminded to return it once the ink begins to leak in their shirt pocket. ​Have you ever dropped your fountain pen, watching in horror as it lands straight on the nib? Choosing to post can avoid damaging the pen when it accidentally falls to the ground. If a posted fountain pen is dropped, it will land on the heavier side (the one with the cap) instead of damaging the delicate pen nib. ​People may not post their fountain pen to preserve the appearance of the barrel. Scratches may be left behind by loose-fitting caps with sharp edges. Another common problem that may arise is a posting ring, which is a visible blemish around the barrel. 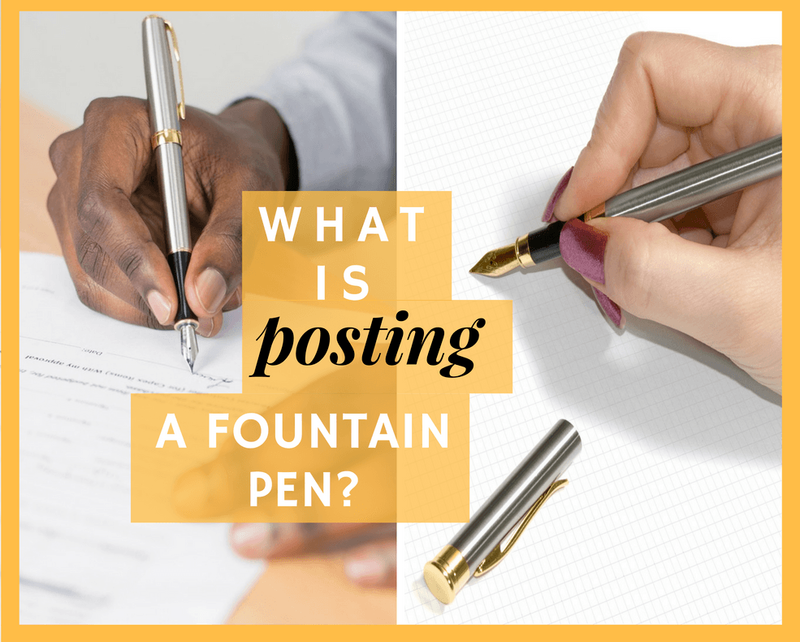 ​What is a 'posting ring' on a fountain pen? ​A posting ring is a ring that appears around the barrel of the fountain pen from frequent posting. ​Posting rings mar the appearance of the pen, but they do not affect its performance. This may be important to people who collect fountain pens or who have chosen an expensive writing tool. 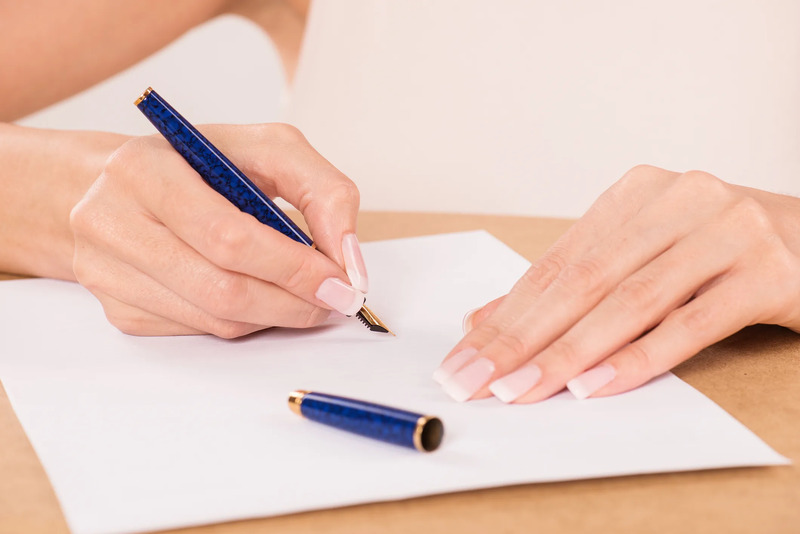 ​Some people, especially those with large hands or who hold the pen farther away from the nib, experience problems with where their hand lies on the posted fountain pen. Their hand grip may overlap with the posted cap, which feels bulky and awkward while writing. ​What if You Don’t Post Your Pen? ​If you do not consider yourself a fountain pen poster, then you will need to do something with the cap while you are writing. 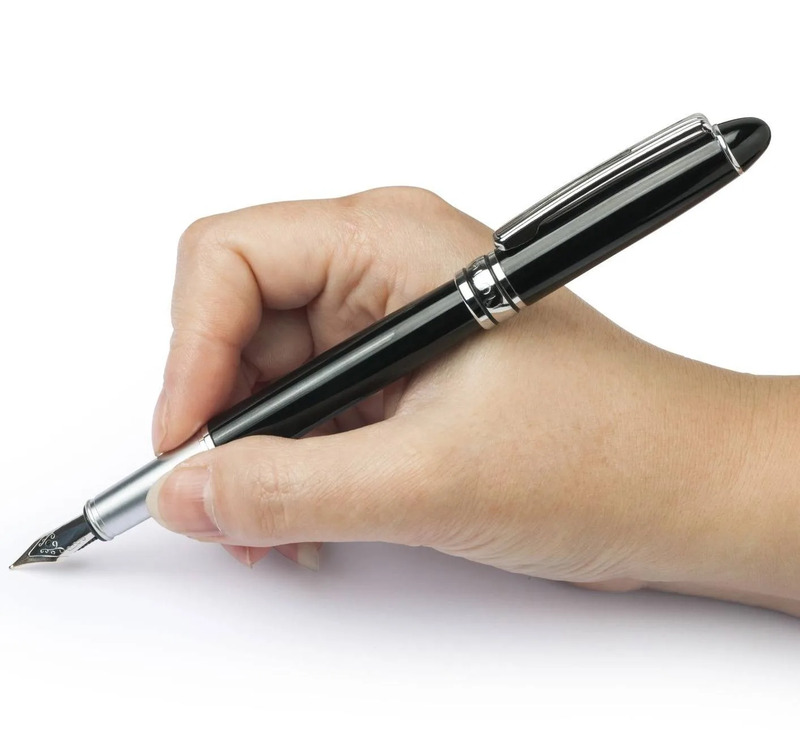 Some people hold the cap in their non-dominant hand as they write. This is useful, as the cap may roll away or get lost amongst piles of papers. 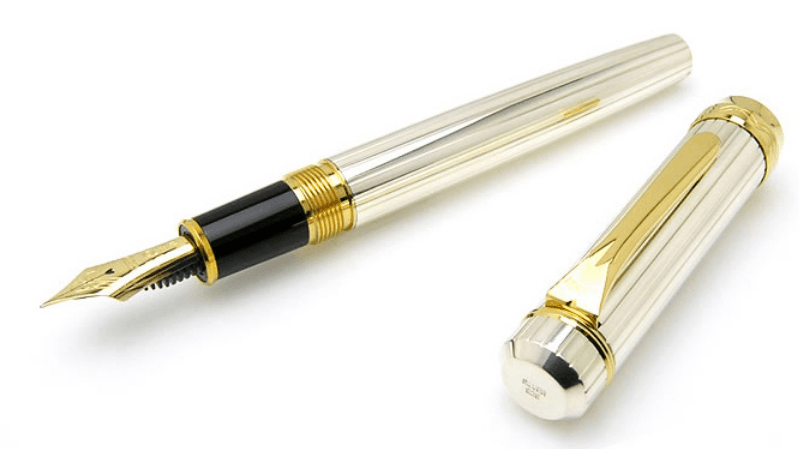 It is also a great security measure if you let someone quickly borrow your fountain pen, because they cannot carry it off without damaging the nib or losing ink. ​“How to Store a Fountain Pen”! Whether you want to post or leave your fountain pen capless is a personal decision. Consider factors including the aesthetics, if posting will damage the pen, and how the placement of the cap affects the writing process. If you do post, consider buying a post-specific fountain pen, like a clutch cap or screw cap fountain pen. This prevents unwanted damage and ensures the pen is designed to provide balance and stability as you write with the cap posted. Personally, I leave my fountain pen posted while writing. It feels too light and flaccid when I hold it unposted. There is also a significant difference in the amount of control that I have while writing. Posting prevents losing the lid, which is a major problem for someone who has a workspace that is a little cluttered, like me. My favorite fountain pen caps are clutch caps. I find that they offer a little more security than a slip-on cap, but do not take as long to secure in place as screw caps do. Enjoy your fountain pen experience in whatever cap position feels comfortable to you! Although this article is comprehensive, ​the information presented ​is only as accurate the material we were able to source, ​and is by no means exhaustive, authoritative, nor complete. If you have additions or corrections which you believe should be included in this page, we invite you to include your comments below. ​Please consider sharing both the citation as well as the new information ​with us. Our goal is to foster an open dialogue with our readers. Please also share the article with fountain pen or ballpoint pen enthusiasts. ​We appreciate you spreading the word! Previous Post 12 World Leaders and Their Fountain Pens Next Post What is a Fountain Pen?